As a pagan and a Londoner, I find the practise of psychogeography is a fascinating way of exploring the landscape of the city in which I live, while the theories about it range from sociological to visionary and occult. This week a group of 10 artists in Deptford has put on an exhibition of their work called PSYCHO.GEOGRAPHY. I went to view it yesterday, and you can see a few photos I took here. The images at the top and the text that went with them (pictured right) show one artist's impressions of a bus journey. 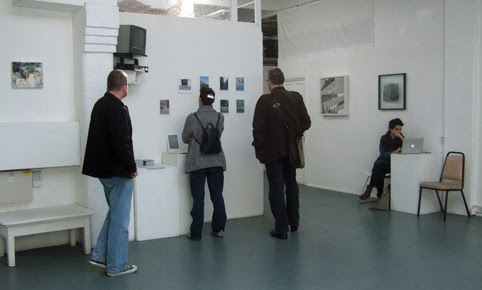 The photo at the bottom is an overview of the exhibition space at Art Hub Gallery, 5-9 Creekside, Deptford. 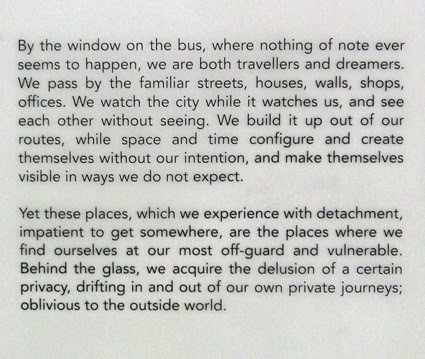 "While Debord is credited with the commonly accepted definition of Psychogeography within the Situationist framework, its roots go much deeper (D. Defoe, W. Blake, de Quincy, etc. ), but more importantly wider – impossible to apprehend and based entirely on personal significance attributed by an individual in interaction with their environment. "Curated by Marina Potok, the exhibition explores how the rich, fast-paced, sharp-edged reality of city life can shape our experiences, emotions and behaviour or simply slip through our consciousness leaving just a trace of our memory." Thanks so much for reviewing the show.